Cannabis that is dried out can be harsh and harmful to the throat. Medical cannabis users who live in dry climates often have trouble keeping their medicine fresh. The CVault by FreshStor is specifically designed to keep cannabis fresh in any climate or environment. The secret to storage perfection lies in the Humidipaks which are included in the jars, made with patented 2-way 62% humidity technology. The packs absorb or dispense moisture, reacting to the outside climate and moisture level in the cannabis. Humidipaks are made with natural ingredients, mostly salt and water, so there is no concern about chemicals being infused into the cannabis. 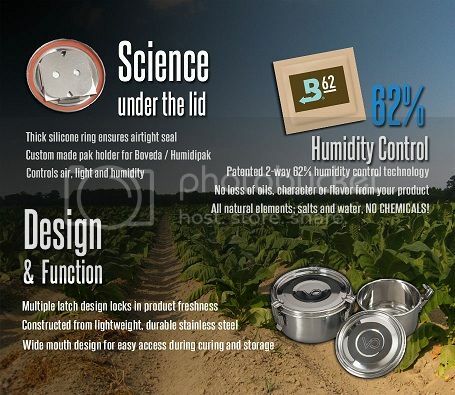 In the lid of the CVault jar there is a pocket which the Humidipak slips into, ensuring that the pack does not lie directly on your cannabis and allowing full circulation throughout the jar. Stainless steel makes the jars extremely durable, with no chance of cracking or breaking like their plastic or glass counterparts. Humidipaks are replaced every two to three months, and the first Humidipak is included with the jar. Check out this picture we found on the FreshStor site, which explains more about the jars. The CVault jars are available in seven convenient sizes, ranging from 'small' to 'mega'. The small jar is about 3" x 2", and the mega is more than 15" high and holds 4.45 gallons. The small jar comfortably holds about 14 grams of cannabis. Whether you need to store a personal stash or medicine for multiple patients, the CVault is the optimum choice for keeping and transporting medical cannabis. CVault Stainless Steel Humidity Control Containers by FreshStor 2.00 out of 5 based on 5 ratings. 1 user reviews.